Where Canada’s largest city meets Lake Ontario looks much different today than when Waterfront Toronto was established in 2001 to oversee, lead and implement the revitalization of the 2,000-acre area, and there’s a lot more to come. However, that future growth is contingent on renewed financial commitments from federal, provincial and municipal levels of government. The largest urban renewal project in North America and one of the largest waterfront redevelopment initiatives in the world is expected to provide Toronto with a variety of parks and public spaces, 40,000 residential units and 11 million square feet of commercial space as it evolves over the next 15 years, Campbell said. Campbell was speaking to about 400 people at a town hall meeting at Toronto Reference Library while reviewing what’s already been achieved and looking ahead to the future of the waterfront. “We’re just starting,” Campbell replied when asked by RENX about future projects to join existing developments such as the Corus Entertainment and George Brown College buildings in the city’s east waterfront area. The Waterfront Innovation Centre, Daniels Waterfront and the River City and Monde condominiums will also be important parts of the area once they’re completed, along with Toronto Community Housing projects in West Don Lands. “The publicly owned lands on the waterfront will have 20 per cent of its units dedicated to affordable rentals so we can be inclusive of people of all income levels on the waterfront rather than just those who can afford the more expensive condos,” said Waterfront Toronto development vice-president Meg Davis. 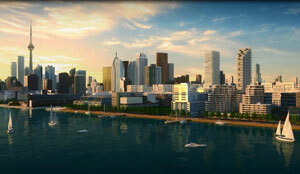 The federal, provincial and municipal governments each contributed $500 million and property to the initiative and gave Waterfront Toronto the authority to develop the land by “using real estate economics to fuel the engine” to foster environmental responsibility, social diversity and economic value creation. About $1.26 billion of the $1.5 billion committed by the three levels of government has been invested, but Campbell is hopeful Waterfront Toronto’s economic benefits will convince them to commit more money to help fund future priorities, including $975 million for flood plain protection, to take it to the end of its mandate in 2023. Those benefits include attracting new development valued at $2.6 billion, construction generating $1.17 billion in labour income and $838 million in government revenues, as well as being a catalyst for private sector development projects valued at $9.6 billion on privately owned lands adjacent to the new waterfront infrastructure improvements. Campbell stressed Waterfront Toronto isn’t running out of money, but told RENX relying on land revenue is a challenge because what it controls is “fairly cheap” and worth 10 per cent or less of what waterfront property in places like Sydney, Australia or Hong Kong sells for, so it can’t realize the value other cities can. Building on land south of Front Street is also difficult and expensive because it consists of dirt dredged from the bottom of Lake Ontario, disused wharfs, abandoned ships, construction debris and municipal waste. “Great cities are determined by their public realm,” Campbell said of Waterfront Toronto projects that have won 60 design awards before he listed many of the parks and public spaces that have been created or revitalized by the agency. These include York Quay, Canada Square, Ontario Square, Portland Slip Water’s Edge Promenade, Spadina WaveDeck, Rees WaveDeck, Simcoe WaveDeck, John Quay, Canada’s Sugar Beach, East Bayfront Water’s Edge Promenade, Queens Quay Promenade, Sherbourne Common, Corktown Common, Underpass Park, Don River Park, Cherry Beach Sports Fields, Marilyn Bell Park, Martin Goodman Trail, Mimico Waterfront Park and Port Union Waterfront Park. * being transparent and accountable to the public and keeping costs down.